Albert Einstein, Stephen Hawking, Michio Kaku, Carl Sagan, Neil deGrasse Tyson. Care to enter into such lofty ranks with a career as an Astrophysicist? These are just a few of the notable figures who have dedicated their lives to understanding how the universe works. Astrophysicists analyze how the laws of chemistry and physics explain the life cycle of galaxies, stars, solar systems and planets (including our own). Put simply, astrophysicists seek to understand the nature of life. Nebula, black holes, worm holes, dark matter, and anti-matter. These concepts are part of the daily language of an astrophysicist. Thanks to the work of people like Carl Sagan and Neil deGrasse Tyson (both of “Cosmos”), we are familiar with these concepts. They have become part of our culture thanks to movies (“Star Wars”) and television (“Star Trek”). Most of us cannot follow in the footsteps of Albert Einstein or Stephen Hawking. However, if you are a curious, intelligent person who loves science and mathematics, and you’re prepared for a lengthy and (at times) solitary intellectual journey, becoming an astrophysicist may be an ideal career choice for you. In fact, most people who choose this field have been curious about the workings of the universe and have felt comfortable with math and science since their childhood. A research career as an astrophysicist is not a job, it is a calling. Asking, and trying to answer, why the universe operates in the way that it does isn’t work for an astrophysicist. It’s a passion. To remain an astrophysicist dedicated to academic research, an advanced doctoral or professional degree is required. That can only be achieved by performing well in high school or perhaps even a bit earlier. Becoming a success as an astrophysicist is inextricably tied to success as a student, beginning with high school and continuing through university, graduate and post-graduate work. Only by distinguishing yourself will you be able to reach the lofty pinnacle of academic scientific research. With each advancing level of education, the number of people you will be working with will get smaller, while the subject becomes more esoteric. You will be working with fellow graduate students, postdoctoral candidates, and your teacher. With luck, you will find a mentor among them. It all begins early. Seek out every opportunity to learn. In high school, don’t be afraid to be a “geek.” Join astronomy clubs and physics clubs and excel in math and science. This will be important to securing a spot in a prestigious university. That will be important to later success. If your family can afford it, there are excellent private summer camps and internships. Summer Discovery and Summerfuel have programs at universities throughout the U.S. and abroad. NASA also has a wide variety of summer programs. The Summer Science Program, a non-profit organization that offers financial aid, has outstanding programs at the University of Colorado in Boulder and at the New Mexico Institute of Technology. It is affiliated with two outstanding universities in the field, the Massachusetts Institute of Technology and the California Institute of Technology. Your career path will be easier if you gain entrance into one of the high-caliber schools listed below. They include some Ivy League schools and a couple in California. Ohio State University also offers a degree in astrophysics, as well as a co-curricular program. In that program, astrophysics majors work with faculty on research programs. You may opt for a school that offers outstanding graduate programs in astrophysics. In that case, get your Bachelor’s Degree in either Physics or Astronomy and make the other field a strong minor. Wherever you pursue your Bachelor’s degree, make sure to obtain a solid background in computer science. This is because many astronomers and physicists write computer programs that help gather and analyze data. Continue to remain active academically during the summer, pursuing internships or other educational programs (see above). After your four years of college, if you want to remain in research and academia, you will need to pursue a Ph.D. (which may take up to six years). Then, obtain paid post-doctoral research fellowship positions, which usually last three years. To reach the highest levels of academia, you may need to do two or three research fellowships. This is before you become a member of the junior faculty. After another three to five years of research, writing, publishing and teaching, you may get tenure. If you choose to stop your higher education or pursue a Master’s degree, you can still get very satisfying work in the field (see below). Modern astronomy applies the laws of physics to the study of celestial objects. It is an observational science (as opposed to an experiential science such as chemistry or biology). Astrophysicists can only suggest theories based on data supplied from “incoming radiation from space. Observations over the entire electro-magnetic spectrum (gamma rays, x-rays, ultraviolet, visible light, infrared, microwave and radio waves) are collected with both earth-based and space telescopes.” (from the Ohio State University brochure). The astrophysicist interprets that data and proposes a theory. After that, other astrophysicists try to prove or disprove that theory; each refinement of the theory advances human knowledge to some degree. Occasionally, such as with Albert Einstein, this work even makes a “quantum leap” (another expression we use thanks to physics) in human knowledge. People’s fascination with the universe occasionally leads to excitement over false claims. This is given our 24-hour news cycle and the lightning speed with which the Internet moves information. In 2014, James Franson, a physicist from the University of Maryland, published an article. He claimed to have found evidence, based on observing a supernova, that the speed of light is slower than previously thought. Other astrophysicists soon pointed out that the original article was published in an uncritically reviewed journal (not peer-reviewed). They pointed out that Franson incorrectly assumed that the speed of light was wrong. This was instead of positing that our understanding of supernovas is incomplete. In fact, the constant, unchanging speed of light, or “c,” has been verified over and over in the decades since Einstein’s work. Most astrophysicists’ work doesn’t make the headlines. However, it is very important and at the cutting edge of human knowledge. Astrophysicists work in laboratories, observatories, or universities. They may also work for the federal government (the Department of Energy, perhaps NASA, the Air Force or the Navy). Or, they may work for federally-supported observatories and laboratories, such as the National Radio Astronomy Observatory or the National Optical Astronomy Observatories. Some astrophysicists who choose to focus on more technical matters might work in the aerospace industry. What Does an Average Day For An Astrophysicist Look Like? If an astrophysicist remains in academia, a typical day will be spent on research (likely including observing and measuring celestial bodies or otherwise verifying data), working on collaborative research projects, which may involve meetings with colleagues, including fellow professors, postdoctoral students, graduate students, and on teaching duties. Astrophysicist Catherine Heymans explained her daily job tasks. One important duty will be writing research proposals for federal funding; competition for government grants is fierce. Astrophysicists who choose other fields or career paths may be applying their knowledge, rather than engaging in research, so they may not be required to research and submit academic articles in respected, peer-reviewed publications. Are You Suited for a Career as an Astrophysicist? “Mathematics is the language with which God wrote the Universe,” said Galileo Galilei. Very strong mathematical, analytical and problem-solving skills are a must for the budding astrophysicist. They must be able to understand problems, research the results and express those results in mathematical terms. However, they must also be able to express those results to others. Therefore, good communication and writing skills are important for grant applications, reports, and requests for funding. Astrophysicists must also be able to collaborate with others on research projects. Successful astrophysicists cannot be complete loners, tinkering over the perfect calculation in a tucked-away laboratory or paper-strewn office. The academic world is a hierarchy, and as such, a certain amount of “schmoozing” is necessary to advance in one’s career. The BLS indicates that there were only 19,900 physicists and astronomers in the United States in 2016. Clearly, the field is quite competitive. 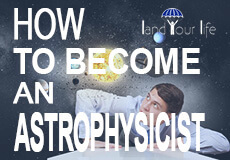 See above for detailed information about the process for becoming an astrophysicist. According to U.S. News and World Report’s 2018 annual rankings, the best places to earn Bachelor’s degrees and Ph.D.s in astrophysics, mathematics or physics are either on the East Coast, in California, in Chicago or in Austin, Texas. The strength of a school’s astrophysics program is tied closely to the quality of its mathematics and physics programs, so rankings in all three are listed below. Not surprisingly, most of the same schools reappear on all three lists. How Does An Astrophysicist Find Work? Developing connections, finding mentors, joining research projects, writing research papers and being invited to be a part of peer review panels or to deliver a talk are important ways to advance your career; most academic astrophysicists work in the educational institutions listed below. The social aspect of an astrophysicist’s academic career begins as a university student, continues through doctoral work, and of course, during the post-doctoral research fellowships. However, doing brilliant work is far more important than being at ease making small talk at your professor’s cocktail party. Astrophysicists can find work in the government, such as with the U.S. Navy (annual salary up to $149,000). NASA or even private companies, such as Virgin, that want to send civilians into space, might be an ideal place to dream of working. NASA hires few astrophysicists, because it primarily builds, maintains and controls satellites. Sending people into space hasn’t been a recent priority. The pay for a full-time astronomer with NASA is around $100,000. What is the Average Salary of an Astrophysicist? According to the Bureau of Labor Statistics, in May 2017, the median salary for physicists is $118,830 annually; for astronomers, the median annual wage was $100,590. Higher salaries may be found by working in state, local or private hospitals ($170,740 in 2017), by providing scientific research and development services ($130,530) or by working in the federal government (excluding the postal service) ($118,440). Because of the nature of the work, top research positions are found in only a few states, where prestigious laboratories or universities are located. According to the BLS, in May 2017, the best states to make a living for astronomers are California, Arizona, Colorado, Texas, New Mexico, and Ohio. The BLS indicates that employment of physicists and astronomers is projected to grow 14 percent from 2016 to 2026. Capable physicists will always be in demand for engineering, medicine, information, communications, and semiconductor technology research and development. What is the best thing I could do for myself right now to improve my chances of becoming an astrophysicist? Now I am in 10th grade, and what course should I take in college to become an astrophysicist? This year I’m studying in 12th std. I want to become an astrophysicist, but I’m looking for more information about it. And what marks are required in 12th for admission in a program?